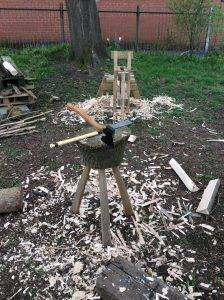 The story of my malletThe first true woodwork I created on my own, my Forest School mallet takes pride of place in my home. 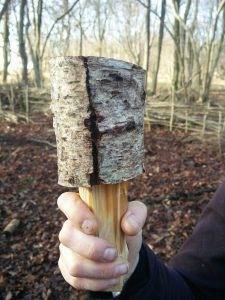 Any new Forest School Leader will hopefully have made their mallet. This represents a step in a journey to becoming a fully fledged practitioner. When I first trained, some 12 years ago, I made a mallet as a symbol of my newly acquired woodwork skills, and it has had pride of place on my shelf since that day. It has withstood the test of time and I feel proud now every time a trainee produces their own. Yes, many fail on their first attempt, splitting the wood straight down and cursing their initial cuts with the bow-saw, but in the end everyone succeeds. Small, achievable tasks with opportunity for failure - it is character building after all! 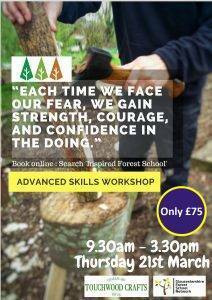 Charles of Touchwood Crafts is coming to our training centre to run an Advanced Tool Skills session on 21st March 2019. 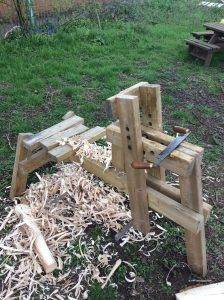 He is a master of tool skills - have a look at his Facebook page to find out what he creates - and will be offering the chance to build confidence in a small, supportive group. 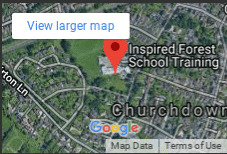 Last year the course sold out, and for only £75 including all materials and a day in the company of an expert practitioner, we are sure it will be a sell out again (as of 3rd Feb we have 3 spaces remaining).